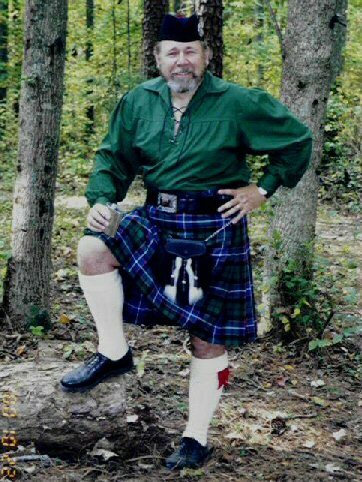 Games in his Russell tartan kilt. John has been the production side of this effort by doing the things that must be done that allow Heather more access to her creative energies. He has done the research to obtain the ISBN numbers that identify "Tails" of the Collie Lama™ to the publishing industry, found the printer and arranged for the printing, entered the manuscript into a format that the printer could use, did a considerable amount of editing and produced this website. He has been Heather's "Friday" throughout the process. Originally from New England, John has lived in Georgia in the southeastern part of the United States for over 25 years. He has traveled quite extensively in Asia, (mostly in Japan) and in Europe, (particularly in Great Britain). As a result of this traveling, he has become very interested in the culture, art, and language of Japan and, of course, of Scotland. John's immigrant ancestor on his father's side was captured, probably at the battle of Dunbar in 1650 or perhaps during the battle of Worchester in 1651, and transported to the colonies where he was engaged to work at an iron smelting furnace in Saugus, Massachusetts. After a period of indenture, he moved to Connecticut where the family resided for the next 300 years. 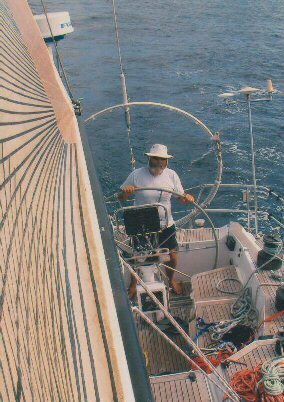 John has a variety of interests which include sailing (he holds a 50ton Master's License), beekeeping, photography, traveling, gardening, history, and reading. John has been sailing for well over 30 years, and he and Heather own a catamaran which is currently located in Beaufort, North Carolina. After working in the computer industry for nearly 30 years, John retired in the Spring of 2001. He was able to bring some of his computer knowledge to bear in building the website for "Tails" of the Collie Lama™ and some of his business skills to the publishing of the book. John has two children, Emily and Matthew, and 3 grandchildren, David, Valerie, and Dylan.